It’s been a few weeks since I talked wine. Allow me to educate your taste buds in one hundred and fifty words or less. 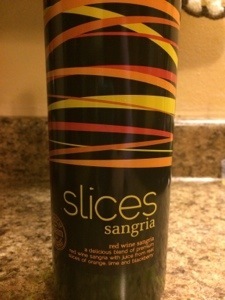 The red wine Sangria produced my Slices Sangria out of Spain is an absolutely sweet and heavenly wine that isn’t dry at all. I haven’t shared it with a single person that hasn’t appreciated its flavor much as I do, well maybe I like it a little more. It is a wonderful end-of-a-bad-day wine. It is infused with citrus fruits and, might I add, it goes perfectly with a bar of Dove dark chocolate. Like I said, end of a bad day. And hey, both red wine and dark chocolate are supposed to be good for you right? Everything in moderation. Go get some and give it a try. I promise you will thank me.